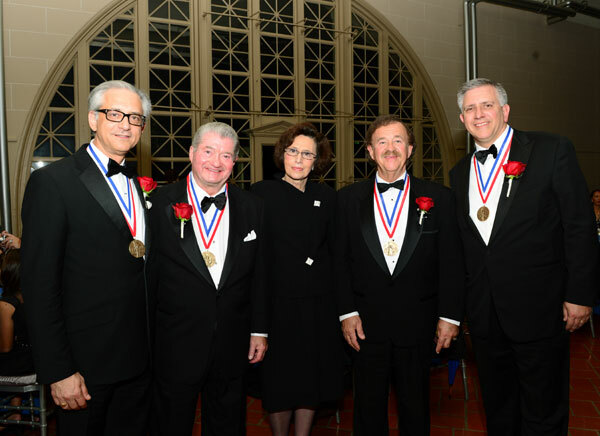 New York.- George S. Tsandikos, Vice Chairman of Leadership 100, and Argyris “RJ” Vassiliou, Treasurer, along with Leadership 100 members William C. Anton and John Psaras, were awarded the Ellis Island Medal of Honor at ceremonies conducted at Ellis Island on May 11, 2013. 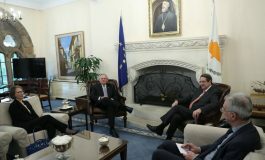 They join other outstanding members of Leadership 100 and of the Greek American Community who have been awarded the medal along with distinguished Americans from numerous ethnic backgrounds. 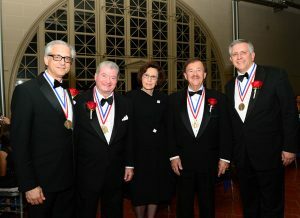 (L to R) George S. Tsandikos, William C. Anton, Paulette Poulos, Executive Director of Leadership 100, John Psaras and Argyris Vassiliou. The Ellis Island Medal of Honor acknowledges Americans who represent “the very essence of the American way of life” with their contributions to the national identity while preserving the values and heritage of their ancestors. In honoring the accomplishments of the recipients, the medal is also meant to honor “the spirit, hard work and values” of those ancestors. Recipients have been chosen and acknowledged since 1996 by The National Ethnic Coalition of Organizations (NECO), which was created to recognize the diversity of the American people that make the nation great and to foster tolerance, respect and understanding among religious and ethnic groups. NECO is also committed to the restoration and maintenance of Ellis Island, the gateway for millions of immigrants to America that stands as a symbol for those who have made America a beacon of hope. Tsandikos is Managing Director of Rockefeller & Company and a member of Holy Trinity Archdiocesan Cathedral, both in New York, where he resides. 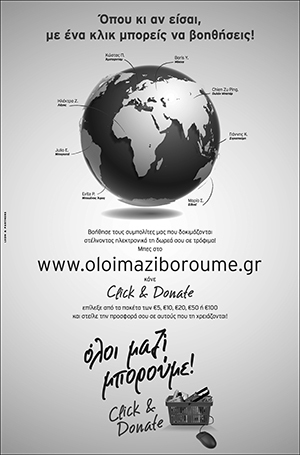 A graduate of Brown University and the Boston College Law School, he is an Archon of the Ecumenical Patriarchate. Vassiliou is President of Acme Pallet Company, Inc., an industrial engineering firm. A member of Church of the Archangels in Stamford, Connecticut, he is a graduate of The Cooper Union for the Advancement of Science and Art and Princeton University. He is an Archon of the Ecumenical Patriarchate. Anton is Founder and Chairman of Anton Enterprises, Inc. and Anton Venture Capital Fund. He launched Anton Airfood, Inc. in 1989, serving as Chairman. He resides in Henderson, Nevada. John Psaras is President of John Psaras Realty, Inc. He is a member of Holy Cross Greek Orthodox Church in Brooklyn, New York, where he resides. He is an Archon of the Ecumenical Patriarchate.